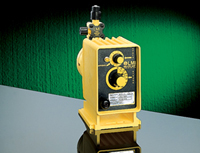 The Series J5 Metering Pump is designed for remote applications where AC electrical power is unavailable. Its low power consumption makes it ideal for agricultural and solar powered installations. Speed and stroke length manually adjustable. Speed may be externally controlled. Click here for LMI Series J5 Detailed Specifications.